Welcome to my site, which documents the planning and construction of a roll-off roof observatory in the Hudson Valley of New York. Construction began in August 2004. First Light at Taconic Observatory was June 25, 2005, and the observatory has been in use since then although many details remain to be completed. As this site is at some distance from my house, it's been a long process but as of this update (February 2006) it's functionally complete but for exterior siding and trim. Please feel free to drop me a line via the email link at the bottom of each page with any comments or questions on the project or the site. When I had just turned thirteen, I spent $200, which was my entire savings supplemented with a loan from my parents – to buy a 6” Newtonian reflector from Edmund Scientific. I still have, and use, the chart table that my father built to hold my Skalnate Pleso Atlas of the Heavens, although I’ve replaced with wheels the ski runners needed to drag it across the snow behind my home in Rogers City, MI and down to my observing site on the shore of frozen Lake Huron. 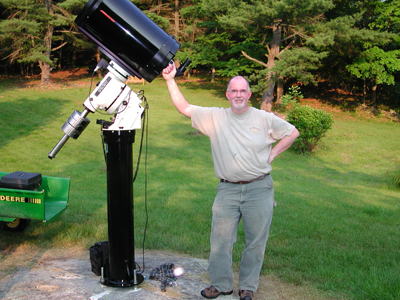 When we moved to suburban Boston a couple of years later, I got discouraged and sold the telescope, although I never stopped reading Sky & Telescope and dreaming about astronomy. It was more than twenty years later when I acquired another scope and became an active observer again. By that time, my wife Ann and I had inherited her parents’ weekend home in southern Columbia County, NY, a beautiful, slowly collapsing old farmhouse and overgrown woodlands in the Taconic Mountains. We live in Boston, and I only get to enjoy the (reasonably) dark skies in New York a couple of times a month and on vacations, so quality observing time is at a premium. It wasn’t long before I began to think about a permanent observatory from which I could once again observe "the heaventree of stars hung with humid nightblue fruit". I thought for a long, long time – about what sort of telescope I wanted, about different sites on the property for the observatory, about dome vs. roll-off, about getting electricity to build the structure and power it once complete, about the innumerable design choices and tradeoffs that needed to be resolved, about what I could do myself and how to get the help I needed. Between the pressures of paid employment, family obligations including some serious illness, and a lot of indecision, more than ten years elapsed. But slowly a concept emerged. Since I was in Boston and the dark skies and scope about three hours west, I wanted to leave open the possibility of remote operation, someday if not immediately. Like everyone, I wanted aperture. I wanted computer control, and I had suffered enough shaky commercial mounts to want something rock-solid. The experience of lugging this mount and tube outside, assembling and aligning for the rare clear Northeastern night only to be promptly clouded out, convinced me more than ever that I needed a permanent facility. I settled on a site for the observatory on a knob of ledge atop a cliff with a view across the Hudson Valley to the Catskills some 12 or 15 miles away. I decided to use sonotube footings for the building and a larger isolated pier to carry the scope itself. I built a frame of lumber around the C-14 mounted in my yard, and determined that a 12’ x 12’ observing room was spacious without being extravagant. I decided to add a warm room to the structure to provide some storage and escape from the winter cold, which made the whole building 12’ x 20’. I settled on a way to move the roof off the structure that I thought would be reasonably light, yet sturdy in our sometimes tough weather. I measured the assembled scope carefully, and tried to remember a little trigonometry to compute the proper wall height. I decided that building on two levels, with a few steps between observing and warm room, would allow me adequate head room in the office while maintaining a low “lookover” height in the observing room for observing access near the horizon. In late 2003, my friend Rick Mills bought a simple CAD program and quickly translated the ideas we had discussed at length into a set of drawings [see "Files"]. In January of 2004, I took those drawings and a simple site survey and obtained a local building permit. I bought a generator for construction power, and decided to get started. I also decided to contract out two pieces of the project: the fabrication of the track and roller carriages from a local steel fabricator, and the construction of the footings and scope pier. The first decision looks sound, the second poor. I could have done a better job on the piers and footings myself, and would do it myself if I was starting over again. Building this project has been a real labor of love and worth every hour and dollar put into it. The use of the facility so far meets or exceeds my every hope - there's just nothing to compare with having a well-equipped and comfortable observatory and a telescope ready to turn to the universe around us whenever the opportunity presents.